The teaser doesn’t contain any actual footage from the final season, but it’s full of enough imagery to have us shaking. As the camera pans over a completely desolate Winterfell, several objects are pointedly shown buried in the snow, like Tyrion’s Hand of the Queen pin, Arya’s sword (Needle), Bran’s chair, and Jon’s sword (Longclaw). The poster that comes along with the teaser is similar to the footage, except a little more direct – everyone of importance is shown lying dead in an icy pile of bodies that’s shaped to resemble the Iron Throne. Even the ol’ Night King is in the pile! The poster is enough to worry even the most optimistic GoT fan, to the point where it’s led one Reddit user to wonder if it’s actually a map to who will live and who will die by the end of the season. Redditor Jnemo412 helpfully pointed out who is who on the poster, so we have a pretty good lay of the land. 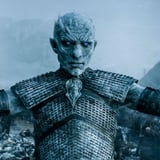 In a theory posed by Reddit user JimmyNice, what if everyone placed on the Night King’s side of the poster (the right) is meant to die? Before you feel personally attacked because your favorite character just happens to be pictured there, hear them out – the fact is that nobody is safe and the folks on that side of the photo are more likely to perish than others. There’s Cersei (who we know has that icky prophecy hanging over her head), Varys (who has also been told he will die in Westeros), the Mountain (who is already dead, but needs to be put down permanently), and poor, sweet Podrick (someone innocent has gotta die!). Of course, there are some outliers that need to be taken into account. Sansa and Dany are both on the right side, and they’re definitely in the running for making it until the end of the season. Plus, Melisandre is on the left, when we all know that Red Witch has got to go. It’s not as far fetched of a theory as it may seem, even though we really hope Pod doesn’t bite the big one. He’s already been through so much!